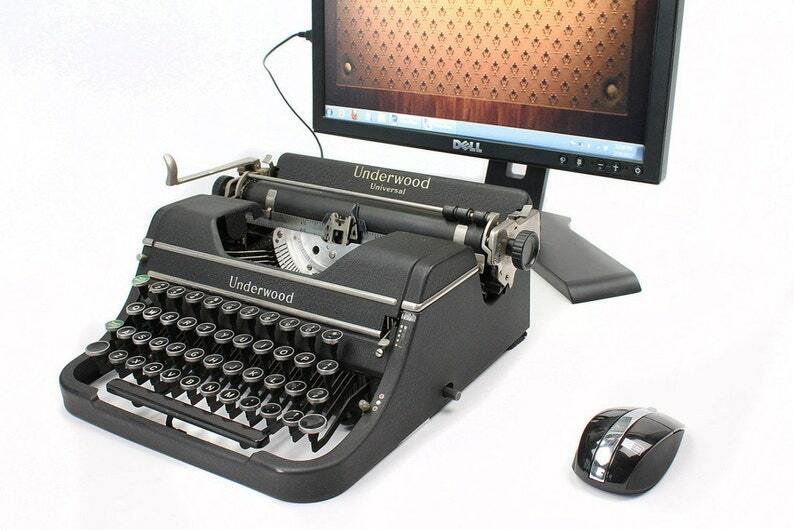 This antique typewriter has been modified to work as a USB Keyboard for PC, Mac, or even iPad! That's right -- its a beautiful and fully functional computer keyboard! You can connect to your favorite computer, smartphone, or tablet using either a wired USB connection, or a wireless Bluetooth connection. The USB Typewriter can type all letters, numerals, and punctuation marks. It also includes shift, space, and return carriage (which is literally activated by the typewriter's return carriage!). Many non-standard keys, such as F1-F12, Esc, Ctrl, and so on are available with special toggle keys. The modification is very clean, and leaves the typewriter looking, feeling, and working like a regular typewriter. You can use it as your primary computer keyboard, or turn off your monitor altogether and type on paper while saving your work to the built-in SD Card memory. You can also use it as a convenient keyboard docking station for your iPad or other mobile device. A beautiful, functional, unique addition to your home office. For more information and an informative video, see www.usbtypewriter.com. If this item is not your style, you can customize your own typewriter with our Easy-to-install USB Typewriter Conversion Kit. The USB Typewriter works just like any USB Keyboard. There is no special software to install, and the necessary USB cable will be included with your order. It is not only compatible with all desktop and laptop computers, but also the iPad, iPhone, and any other Bluetooth-enabled mobile devices. The new Bluetooth feature means it will work with any Bluetooth-enabled tablet or smartphone. The iPad Pro and other oversized tablets may not fit on the platen, however. As featured on: Gizmodo, Boing Boing, WIRED, Engadget, CNET, Martha Stewart, Vanity Fair, the New York Times, Make Magazine, and the Financial Times. Really nice! Thank you very much! Hope my gf likes it for her Bday!